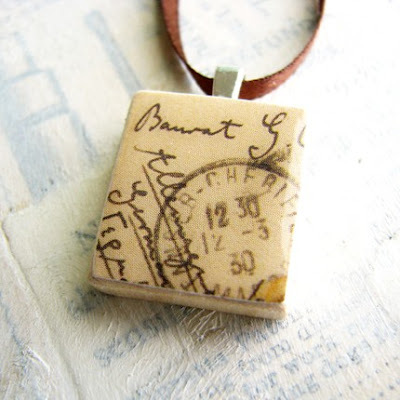 You may have guessed by now that I love wearable art. It's no wonder then, that the work of today's featured artist, Vickie Porter, from Rochester, New York, appeals to me. As a self-confessed doodler, I never would have thought of framing my mindless tinkering, but look what Vickie does with hers! She doodles, draws, and works with a wide variety of beautiful papers to create "tiny works of awesome". Vintage wooden dominoes serve as canvases for her colorful creations. Recently Vickie suffered a very frightening migraine that resulted in paralysis on one side of her body. Thankfully she's recovering nicely, and credits her love of making art with helping to regain fine motor skills. Of course her determination is a tremendous benefit too. This altered Scrabble tile is covered with decorative paper and sealed with a clear, acrylic coating for protection. 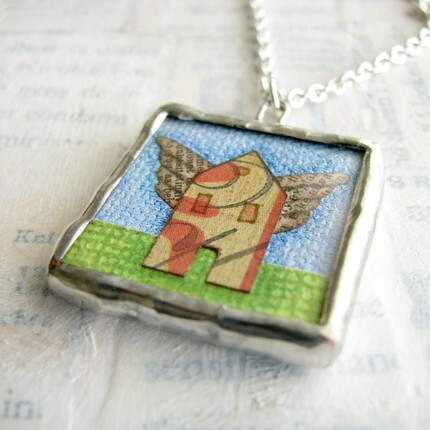 I think this inch-square pendant called Fly Away Home is my very favorite. Vickie sandwiched the layered paper collage between two microscope slides and soldered them together with silver alloy. 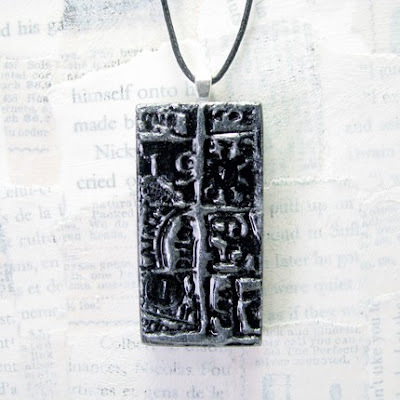 She created the print on this domino from a miniature version of one of her larger, composite collages for which she uses a variety of papers, rubber stamps, acrylic paint, and ink. A black and metallic silver design is embossed for a chic look. 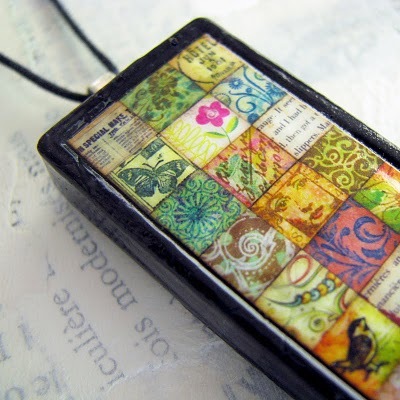 Vickie's In My Head Studios Etsy shop offers the option of customizing a domino pendant (or Scrabble tile, microscope slide, etc.) with one of her designs or one of your own. She'll apply a special graphic, photo, or your child's art work... as Vickie says, "You dream it, I can do it!" With a positive spirit like that, I'm excited to see what the future holds for her. 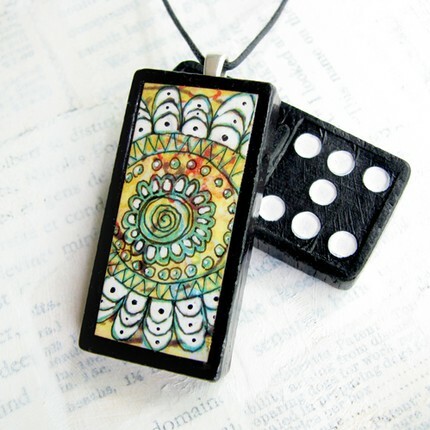 Really love VIkie's domino pendants! They are all very beautiful! I love that she uses microscope slides! Very neat. I highly encourage anyone who doodles to go further with their ideas! I love them all! Oh but that colorful, quilt-looking design is wonderful! Vickie ~ I hope your recovery continues .. you are an inspiration. so much fun! love 'em! so unique and creative. I love that domino with all the little squares on it. Wonderful feature! I love the imaginative creativity of Vickie's designs. 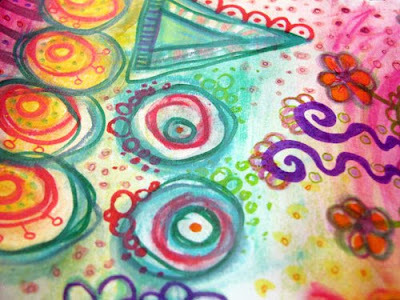 So colorful, playful and fun! I'm happy to say Vickie is my (real-life!) friend. Her art is even more beautiful in person!